There may be times when you don’t want any color in an image. 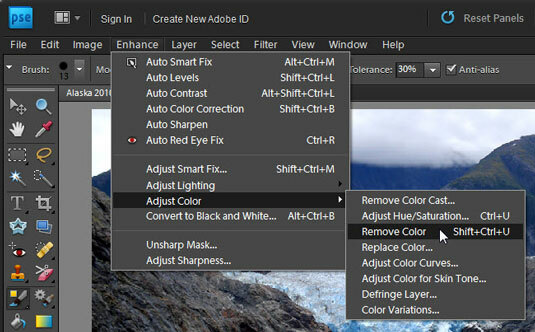 With the Remove Color command in Photoshop Elements, you can easily eliminate all the color from an image, layer, or selection. To use this one-step command to remove color from an image, simply choose Enhance→Adjust Color→Remove Color. 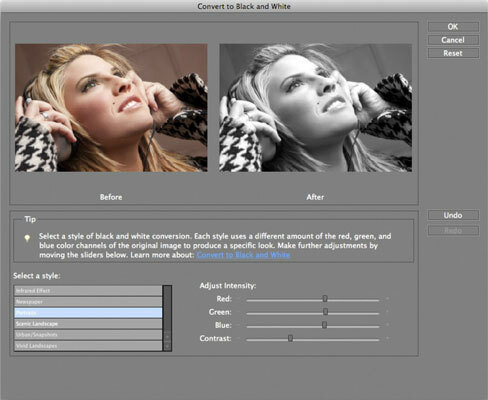 Sometimes, stripping away color with this command can leave your image flat, or low in contrast. If this is the case, adjust the contrast by using one of Element’s many lighting fixes, such as Auto Levels, Auto Contrast, or Levels. Use the Remove Color command to eliminate all color from an image. Choose Enhance→Convert to Black and White. The Convert to Black and White dialog box appears. This dialog box enables you to select a conversion method by first choosing an image style. Select an image style from the Select a Style list. Add or subtract colors (Red, Green, or Blue) or contrast by moving the Intensity sliders until your grayscale image looks the way you want. You aren’t really adding color; you’re simply altering the amount of data in the color channels.